Our main heroine is a young lady, Miss Deborah Grantham, who, being an orphaned child without her own personal fortune, happens to help her aunt run a gambling house. As you might guess it is an occupation that is not looked on with approval but at least you don’t lead a boring, lone life. In fact pretty and viviacious Deborah drinks champagne every evening and has plenty of admirers. Young Lord Marblethorpe, is one of the most ardent ones and, to the utter distress of his aristocratic mother, plans to marry the girl as soon as he turns 21. Deborah, hardly pleased, tries to talk some reason into his young head although the marriage would solve most of her and her aunt’s problems – the truth is that deep down the girl remains a very decent person. She is forced by circumstances to be in company with rogues and gamblers but she is not enjoying their wickedness. However, who would believe her? Lady Marblethorpe, considering the situation as serious, calls upon her nephew for help and thus we meet Max Ravenscar, a 35-year-old, extremely rich bachelor of ” lean, harsh-featured countenance with an uncompromising mouth and extremely hard grey eyes”. Definitely not a man to be trifled with. He likes boxing and horses; he is also known as quite tight-fisted. After a short conversation with the distressed aunt he becomes absolutely confident that a monetary offer will be sufficient to free poor young Lord Marblethorpe from bad company and send a harpy like Miss Grantham on her way. He soon discovers, though, that Deborah is not an ordinary miss but a feisty Amazonian with plenty of backbone. The stage is set for a very funny battle of wits between two strong-minded and determined people. Small wonder it will end with two marriages. The story is full of action and moves along at a cracking pace – there are mishaps and miscommunications, elopements, kidnappings, and, at only 285 pages, it makes for a quick and entertaining read. 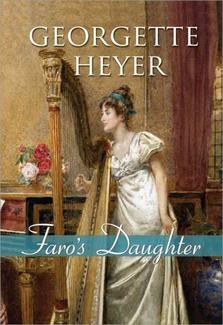 Ms Heyer was a meticulous researcher and each of her books will reveal its own snippets of historical and cultural knowledge and a little something that makes it unique. I do appreciate all these efforts but still, plot-wise, all Heyer novels do seem very similar. Sometimes it is a good thing though – you know what to expect. The repetitiveness of the plot. In Ms Heyer’s world if a young, well-bred, beautiful lady is in dire financial straits she must and will meet a rich bachelor and fall in love with him. There’s always a happy marriage at the end. If only real life was as simple as that…and where are stacked up all the hordes of ugly girls without money btw? Apart from that I don’t particularly like the cover of my edition (posted above). Obviously the dress of the lady is totally wrong but even worse , why is this young woman playing a harp? Shouldn’t she be playing cards or a roulette instead? No character in the book played a harp EVER. This is my second regency romance by Georgette Heyer and I must admit that, unless you are an absolute and devoted fan, you have to be in the mood for the period and for comfortable “happy endings” to read books of Ms. Heyer. I don’t want to imply that personally I am never or hardly ever in such a mood but sometimes her romantic novels do seem just too maudlin for a modern woman. This one wasn’t bad but I did feel I have read something like that not so long ago…in short no surprise whatsoever. Still, plenty of fun. Thank you very much *blushes profusely*. I must read Good Omens soon or I will get burned to a cinder with curiosity! Hmm. I'm beginning to think that the Heyer Regency may not be my cup of tea. These novels are certainly NOT for everyone. Either you love them or else.